In order to have a fulfilling surfing trip, you should be adequately prepared. There are several things one can do upfront and not waste your limited vacation time. You might need some new surf trunks for Costa Rica. Pack your surf shorts, rash guard and maybe even a surf hat. To protect yourself from the strong sun rays a rash guard is recommendable. A surf hat can be handy, especially if you are bold or getting bold. Try your surf shorts and rash guards on, maybe it has been a while since you surfed the last time. If your gear does not fit you anymore you should get some new stuff or even better get in shape. So that shorts and shirts fit you again, before your trip starts. You will appreciate to be in good physical condition once you are on your board. Extra pounds will submerge your board more and generate more drag. You will waste more energy and paddle slower. Bring good sun screen and sun blocker with you. Even on a cloudy day sunburn can occur rapidly, especially as close as Costa Rica is to the equator. Quality sun screen for surfers is available at surf shops in Costa Rica, but not at every surf spot there is a village or even a surf shop. In addition, it is very likely that sunscreens are more expensive in Costa Rica than back home. That is not the leash that you want to take on your surf trip to Costa Rica. Check your gear on time to avoid unnecessary surprises. Check your surfboards on time so that you still can get dings and cracks fixed. Have a look at your fins and fin system. Control the screws and the fin tabs. Don't risk figuring out that one of your fins is broken when you’re sitting in the ocean at a surf spot in Costa Rica with fantastic waves. You don't want to waste your time fixing your gear while your buddies score one wave after the other! Check your leash thoroughly. Hopefully you didn't store it tightly wrapped around the tail of your board. If you did it is very likely that it has kinks. It is almost guaranteed that it will wrap around your legs during your first surf sessions. Hang it from the clothesline or any other hook so that it can straighten out. The same applies for brand new leashes. They come wrapped and have some kinks, they too need to straighten out. Leashes are made of urethane and dry out over time, they become less elastic. Even if your leash was in perfect conditions the last time you used it, it's possible that the leash cord has small cracks because it was stored wrong or just because of the age of the leash. 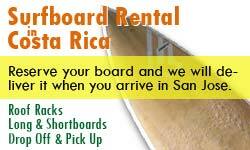 You should also consider if it wouldn't be cheaper and less hassle to rent the surfboards in Costa Rica. Charges for boards vary a lot between airlines. Even if the amount your airline charges you is affordable there is still the risk of receiving your boards damaged in Costa Rica. In case you decide against bringing your own quiver it's recommendable to do some research upfront where and if you will be able to find the boards of your choice for rent in Costa Rica. Costa Rica is a tropical country and the ocean is warm. Surfers use wax for tropical or warm water here. It's a bit of a personal choice if you prefer stickier, softer wax or the harder tropical wax. Both of them work very well in Costa Rica. Bring some insect repellent. Though not essential, because you can get it in almost all supermarkets in Costa Rica. Deet-based and deet-free products are both available locally. Bring a key lock box to store the keys from the rental car and hotel while you are out surfing. It's an unnecessary risk to just hide them. Don't forget to leave a small flashlight or a lighter with the lock box. Otherwise you won't be able to read the numbers of the keypad after your sunset session, it gets dark early in Costa Rica. Besides the items mentioned above the following recommendations apply for all travelers, not only surfers. Costa Rica uses the same outlets as US and Canada. If you come from Europe, you might need to bring adaptors. Make sure you take your passport and driver's license; your passport should be valid for at least six months. Good preparation can make the difference between the best surf trip of your life or a horror trip.